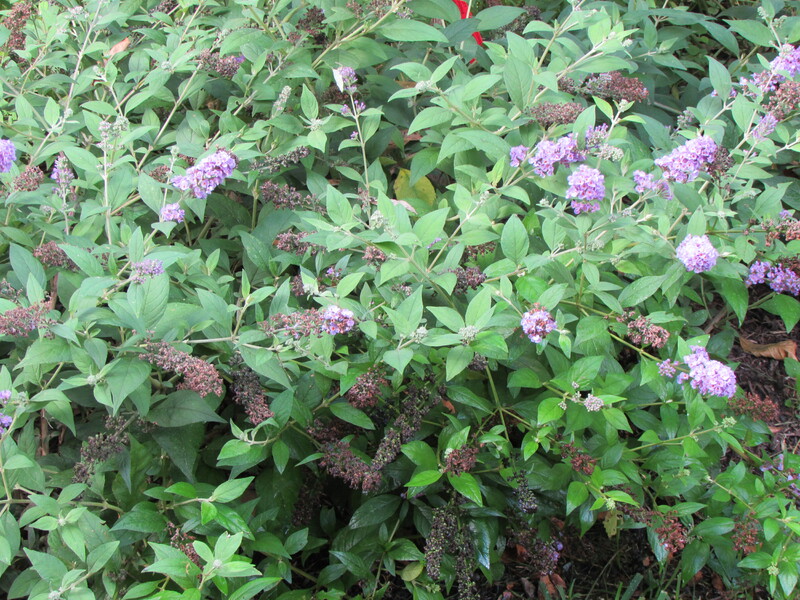 Blue Chip Buddleia for beauty, birds and butterflies! A favorite perennial shrub of mine for cottage gardens, butterfly attracting gardens and as a low border is Blue Chip Buddleias. They are true dwarf buddleias, only wanting to be about 24” to 30” tall and wide. They growing fairly quickly into a mound shaped small compact bush. Mine were about 10” balls when we planted them in early spring and they are already nearly full grown. Their blooms are beautiful cones of tiny violet-blue flowers with orange corolla throat. The leaves are elliptical and about 2 inches long. Birds and butterflies love the flowers. I only wish I could have captured a picture of one of the hundreds of butterflies that have come by for a visit. 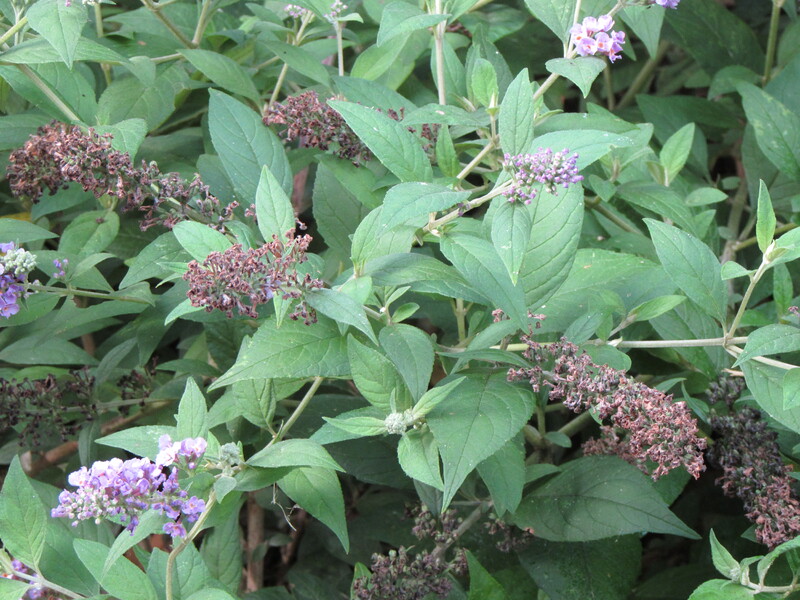 Blue Chip buddleias are new comers to our market were first released commercially in 2007 and patented in 2009. 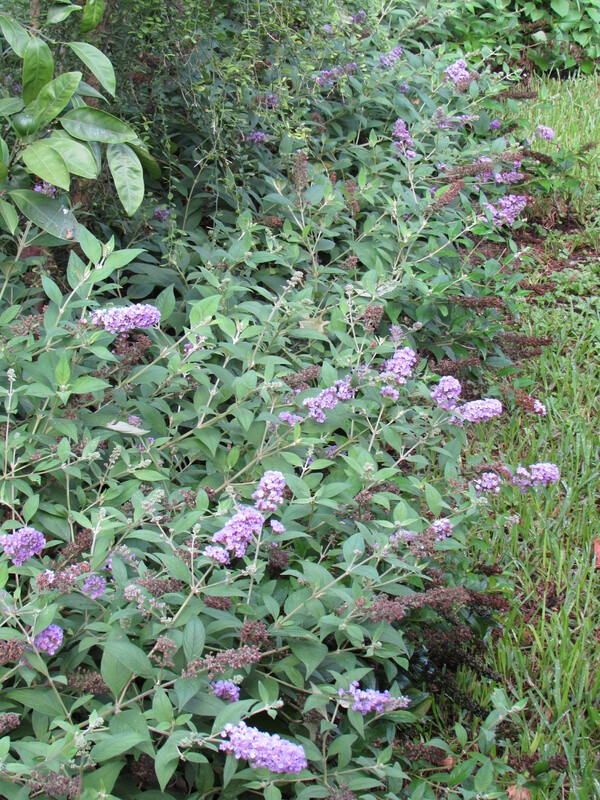 Lo & Behold® ‘Blue Chip’ Buddleia hybrid USPP 19,991, Can 3,602 were cultivated by Dr. Dennis Werner and Layne Snelling at the J.C. Raulston Arboretum, NCSU. Mine have been blooming since early May. They are known for their long lasting blooms and should continue blooming till our first frost. 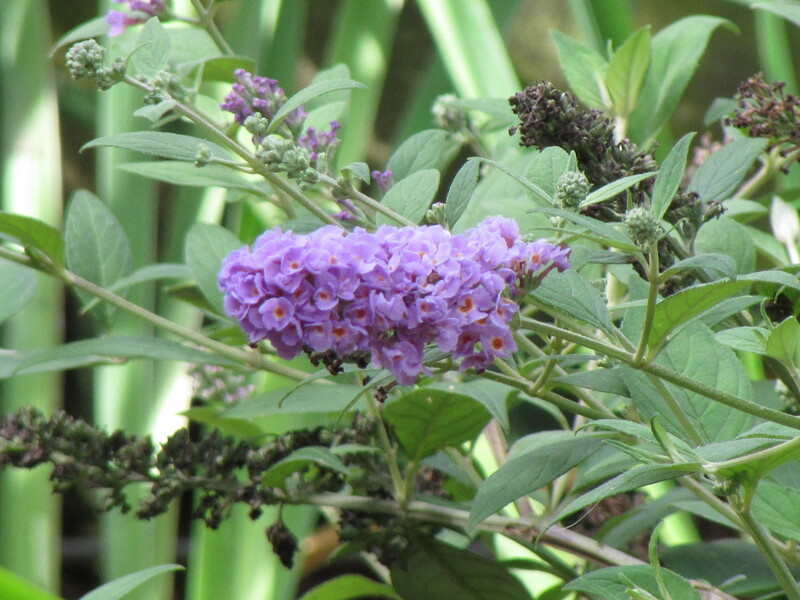 All types of buddleia do well in Houston because they are heat and drought tolerant and like full sun. They are known to be deciduous but more so in places with colder winters than in Houston where they are semi-deciduous. They are very hardy and need little maintenance. We use and all-purpose organic fertilizer on our whole garden every other month and we spray with diluted liquid seaweed extract during the summer to help with heat stress. They may need a little trimming once a year but only if they over grow the space they are in. Buddleia blooms on new wood so trimming to stimulate new growth will help them be showier but isn’t necessary. Blue Chip buddleias make a great container plant. Which is nice for decks and roof gardens where people would like to attract butterflies. I like them as a low border plant. When I get requests for lavender, which doesn’t grow well in our hot humid climate, I suggest these little shrubs. I have used them in designs for a couple of years and they went through our hard freezes last winter without any problem. Blue Chip Buddleia boarder in front of my citrus hedge. In 2008 they were voted the second most attractive cultivar out of 97 candidates by the public in the Euro trials held by the Royal Horticultural Society at Wisley test gardens in England. If you have never been to RHS Wisley’s website it is full of information and pictures. It was always my first stop after landing in Gatwick airport durning my 10 years of traveling to UK regularly. Very pretty! Butterflies are so hard to photograph. Never still for long and their flight is so erratic! Some times I think to get a tripod and sit a while but it is to humid these days and my list of things to accomplish beacons me : ) My husband gets pictures of them but I think he is a butterfly whisperer. They land on him or just sit an pose for him. You have just painted such a lovely image in my mind. What a lovely Buddleia! I have three ‘volunteer’ buddleias in the garden, which just planted themselves (buddleia is a very common ‘weed’ in the UK), and I’m also trying out one which has little yellow balls of flowers – can’t remember the name at the moment, but I’ll post when I have it. All are magnets for bees, hoverflies and butterflies. How interesting that yours suffer from heat stress, but then I guess they were originally from the Himalayas….